I’ve been an admirer of Micro Scooters for a long time, having seen my friends with their toddlers and children racing around the park on scooters. 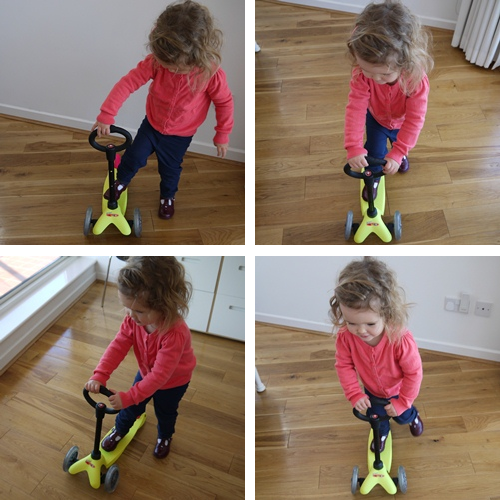 I thought I’d need to wait until my toddler was at least 3 years old before trying a Micro Scooter, until I found out about the ingenious 3 in 1 Mini Micro Scooter which is designed for children aged 1 to 5. A few weeks ago we were very lucky to receive a 3 in 1 Mini Micro Scooter for review with my 2 year old toddler from the lovely team at Micro Scooter. 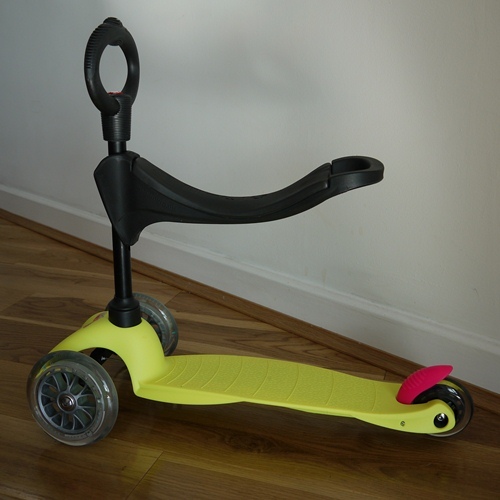 We chose the scooter in a vibrant neon yellow colour, which Imogen loves. 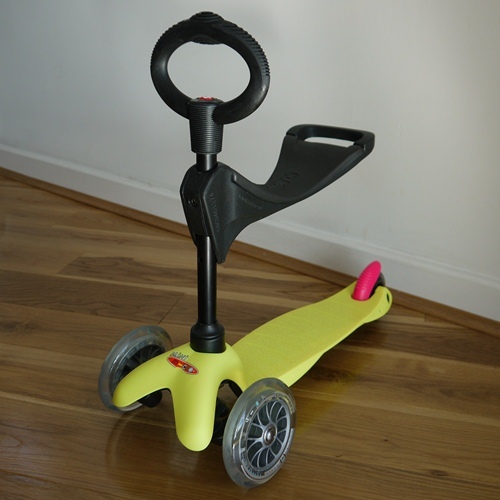 The 3 in 1 Mini Micro Scooter comes with the Scooter, Seat, O-Bar handle and T-Bar handle so you can adjust it accordingly for your child’s age giving your child the flexibility to grow with the scooter. It starts out as a ride on scooter with O-Bar handle and seat, then transforming into a small scooter when the seat is removed and eventually it becomes a Mini Micro Scooter when you add the T-Bar handle. The black O-Bar and Seat is easily attached and we find it’s perfect for use when toddlers are gaining confidence in their agility and skills in balance and coordination. Imogen loved trying her new 3 in 1 Mini Micro Scooter. 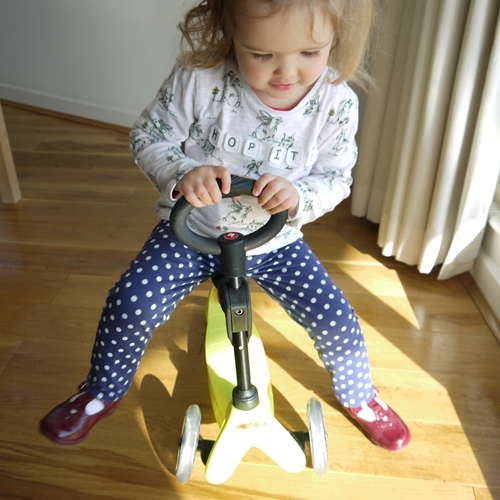 For the first couple of weeks she rode the scooter using the O-Bar and Seat, which is suitable for children aged 1 to 3 years old. 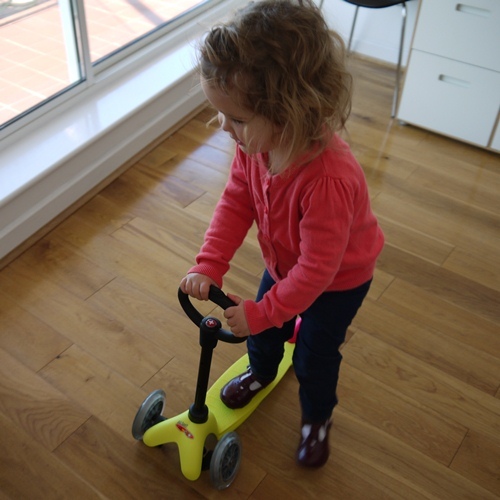 We find the scooter is perfect as an indoor toy and it glides smoothly on our wooden floors, adding variety to Imogen’s playtime at home. Imogen soon got the hang of it and was scooting around at increasing speed, using her feet to push her along. The 3 in 1 Mini Micro Scooter provides toddlers with a skillful challenge in balance and coordination of movement. I’ve been impressed with the stability of the scooter and the very gentle turn of the wheels, making it safe and sturdy. When Imogen was ready we transformed the 3 in 1 Mini Micro Scooter into a small scooter by removing the seat and leaving the O-Bar handle attached to the scooter so she could scoot around on it standing up. Imogen enjoyed stepping on and off the scooter and soon learned the basics of riding a scooter while she practised steering with the O-Bar, which is very easy for little ones to hold on to. Finally we transformed the 3 in 1 Mini Micro Scooter into a Mini Micro Scooter by replacing the O-Bar handle with the T-Bar handle. 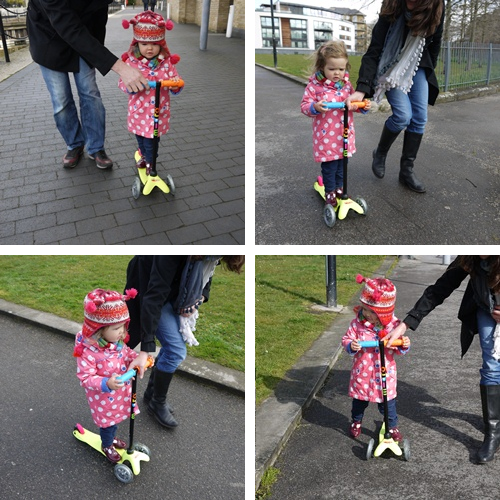 We simply couldn’t resist taking Imogen out to the park on her Mini Micro Scooter and she thought it was wonderful! Imogen rode the Mini Micro Scooter with Mummy and Daddy holding the scooter whilst she got a feel for being on it outside. The Mini Micro Scooter T-Bar provides a good grip for young children to hold whilst moving along with the scooter. After a few minutes Imogen was putting one foot on the ground to push the scooter along herself. It was great to watch and shows how she’s progressed from using the scooter with the O-Bar. The Mini Micro Scooter is suitable for children up the age of 5. Imogen adores her 3 in 1 Mini Micro Scooter and it’s rarely out of her hands. As parents we think it’s one of the best activity toys around. 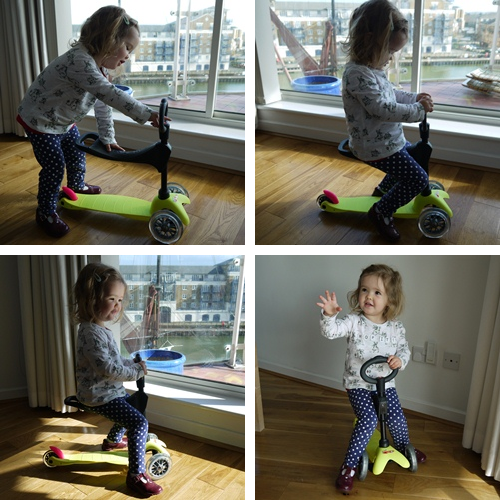 The scooter is well designed, safe, durable, suitable for indoor and outdoor use, flexible, light to carry and most importantly it encourages Imogen to discover and master the skills of balance and coordination whilst giving her a new found freedom. The Mini Micro Scooter won Best Toddler Toy in the 2012 Nuremburg Toy fair. You can find out more about the incredible range of Micro Scooters at www.micro-scooters.co.uk. Disclaimer: I was sent a 3 in 1 Mini Micro Scooter for the purposes of this review. All opinions and thoughts are my own. 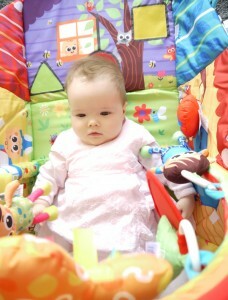 The Fisher Price Rainforest Gym is a highly recommended activity gym and play mat for your baby. Suitable from birth, the Fisher Price Rainforest Gym has 5 activity toys for baby to play with and lights, music or nature sounds that activate when movement occurs. The Fisher Price Rainforest Gym has many different textures to stimulate your growing baby. Rainforest friends can be placed above baby or below, to encourage tummy time. There’s a soft monkey, jingly toucan, elephant and parrot with a spinning paddle. The movable and stationary toys encourage exploration on the overhead gym or for tummy time play. Baby can also enjoy a spinner with rattling beads, spinning butterflies, a shiny mirror and a crinkly leaf for peek-a-boo fun. Select from four musical tunes or rainforest sounds to entertain your baby when playing on the mat. These can play for up to 20 minutes. The Fisher Price Rainforest Gym is one of the best baby activity play mats you can buy. An activity mat and play gym is something worth buying before you have your baby as it can be used from birth and will often adapt to create new play environments as your baby grows. Activity mats help to encourage tummy time and many have added features that allow baby to discover different textures, lights and sounds within the area of the play mat. The Lamaze Pyramid Activity Mat is the best baby activity gym play mat you can buy for your baby. It keeps our baby entertained for hours and encourages tummy time and imaginative play. The Lamaze Pyramid Activity Mat transforms with each stage of baby’s development from newborn to tummy time to imaginative playtime, providing plenty of ways to play and interact. It has a cushioned play mat which baby can lie on or sit on with a bright and engaging environment of characters with soft side walls which helped to keep our baby safe when she started rolling! It folds into a play house for older babies to play with when they are able to sit up unaided. The Lamaze Pyramid Activity Mat is reversible, with colourful pictures and characters on each side and includes an overarching rainbow which holds the soft sides of the mat up so your baby can lie underneath and gaze up at the rainbow and toys. The toy figures can be attached to the rainbow or the play mat or they can be kept separate for your baby to play with individually. The activity gym play mat comes with 5 soft toys – boy, girl, baby, cat and flower. The Lamaze Pyramid Activity Mat has a musical sun that can be attached to the rainbow or played with separately. The musical sun plays tunes and can be set to be activated by movement so as your baby enjoys kicking their feet in the air and on the floor, the music will play and the lights will flash to encourage your baby’s movements. And there’s a volume control on the musical sun so you can set it to your desired sound level. 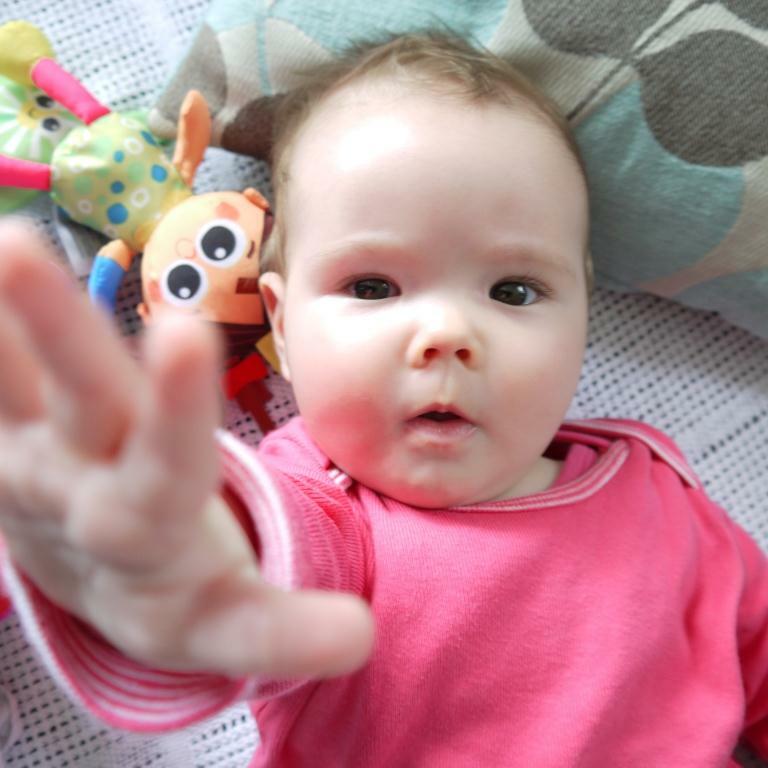 It’s really important to introduce tummy time into your baby’s day for a few minutes a day. This helps to strengthen their muscles as they try to push themselves up off the floor and it encourages coordination. You can read more about the benefits of tummy time. The Lamaze Pyramid Activity Mat has sides that can be folded up and held in place with velcro attachments to allow baby to see themselves in the detachable mirror and to look at the different characters. This activity and play mat will be used daily by your baby. It can be simply wiped clean or machine washed when needed and it drys quickly so your baby won’t have to wait for their next round of play on the activity mat!